Here's a terrific sentiment read: the amount of money individuals have exposed to equities relative to their historical average. The chart below shows equity allocations by individual investors above and below their normal 21 year mean allocation to stocks (the 21-year mean allocation to stocks is typically 60 %). An interregnum (plural interregna or interregnums) is a period of discontinuity of a government, organization, or social order. Archetypally, it was the period of time between the reign of one monarch and the next (coming from Latin inter-, "between" + rēgnum, "reign" [from rex, rēgis, "king"]), and the concepts of interregnum and regency therefore overlap. An interregnum can simplistically be thought of as a "gap", although the idea of an interregnum emphasizes the relationship to what comes before and to what comes after in a sequence. This contrasts with a near synonym like gap, which may be random, encompassing neither connotation of interjacency in a sequence nor formal interrelation. Who could have predicted that traders would be celebrating the decline of the Chicago Board Options Exchange’s volatility index below the 50 mark? We saw the VIX peak late October, coincident with the worst of the credit freeze and market panic. The VIX closed yesterday at 47.76, down 11%, for the first close below 50 after an incredible run of 21 consecutive days above 50. 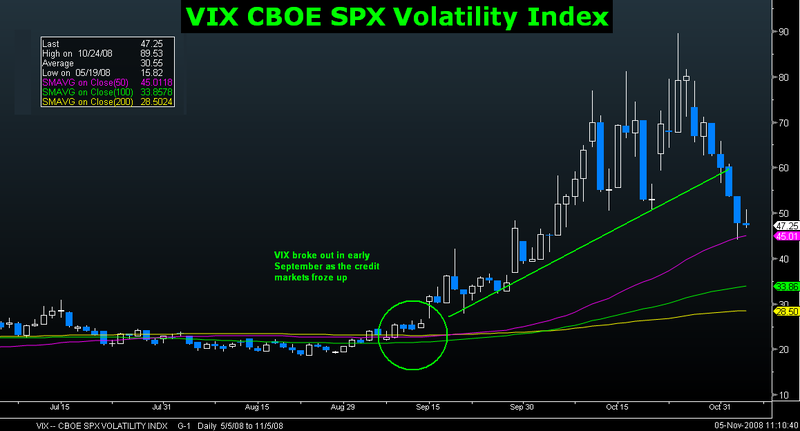 The VIX peaked late October, coincident with the worst of the credit freeze and market panic. Volatility has begun to diminish as investors reduce their worry about the state of the markets, even as the outlook for the economy worsens. One thing we learned: The prior measure for volatility "highs" around 30 are not reliable entry points for bad dislocations. They have in the past signaled sufficient panic that you could buy in, but that is a level that traders may no longer find much faith in. Peter Boockvaar reminds us that the VIX has closed above 30 for 37 consecutive days, and may still surpass the period in 1998 during the Long-Term Capital Management debacle where it was above that mark for 50 days. The current worldwide liquidity crisis may yet take a long time to stabilize . . . and I would expect the VIX to also take an equal amount of time to find a more moderate level. Over at the NYT's economics blog, Economix, David Leonhardt is running a prediction market contest, looking at odds of various Intrade contests. Pick any 3 of the 20 questions to answer, and the winner gets showered with untold glory and fame. The contest has an interesting twist: Its based upon the odds at Intrade. That makes the choices less obvious and the strategies for winning the contest more intriguing. David asked me to submit a "guest" contest post for the Economix blog, which I did. You will find it below. In addition to my post, David graciously invited all of you to participate, saying: "You have a lot of really smart readers. Let's see how well they can do in the contest." Challenge accepted. The contest runs til tomorrow morning at 6am. Go over to the prediction market contest and submit your best guesses. Let me begin with this (weasely) caveat: While I have spent many years studying markets, I am not remotely a political analyst. In fact, I dislike politics, and I especially detest how it has polluted economics. That said, be aware that my preferences in 2000 were the exact opposite of what actually occurred. My choices were McCain, Bradley, Gore, Bush – and that was pretty much the order they lost in. And by way of full disclosure, I am probably best described as a Liberal Republican – low taxes, balanced budget, strong defense, no unnecessary overseas involvement, and no government involvement in personal matters (birth control, abortion, gay marriage, etc.) Liberal Republicans are now mythical creatures that no longer exist. I do not recognize the abomination that now calls itself the GOP. I guess that makes me an Independent. OK, let’s move on to the contest, where whatever mathematical skill I may have could be of some small assistance in this contest. My first thought: Picking the frontrunners and favorites appears to be a surefire path to the middle of the pack. To “win” this requires identifying which of the long shots really aren’t such long shots after all. In the markets, this is called variant perception – what the crowd (and the money they bet) betting thinks is an unlikely outcome, but is actually a higher probability result than most realize. (The best parallel company example is deep value stocks). That is the fiscally prudent thing to do, but that’s no fun. And since its not real cash, why not go for it? What might be the variant outcome that most people think is very unlikely? I come up with 3: 1) A McCain victory; 2) A surprisingly tight race; 3) An Obama blowout. A McCain victory is (in my terrible political judgment) highly unlikely. The next variant perception scenario is either a very tight race, or an Obama blowout. I don’t see McCain winning Ohio, Pennsylvania, or Virginia; He does have a good shot in Florida, but its not a great payoff (2.7 pts). Same with Obama winning Indiana (2.4 pts) and Georgia is a long shot. 13. Democrat-Republican breakdown 271 or more. While I give this a less than 20% chance of occurring, it’s the highest payout. In an election where one of candidates ran many Hail Mary’s, it is only fitting. One last caveat, so my clients don’t have a heart attack: This sort of low probability, high payoff is the exact opposite of how we run money in the office. It is why we’ve stayed out of trouble most of this year . 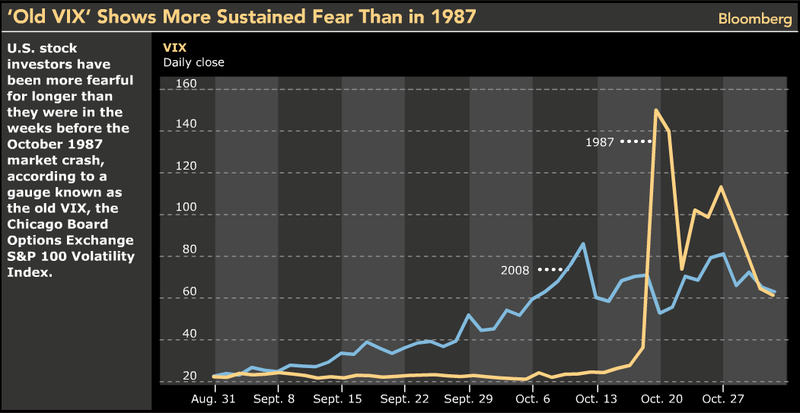 . .
Did October 2008 Panic Exceed the 1987 VIX Levels ? In all of the end of month mayhem last week, you may have missed the above Bloomberg chart-of-the-day on Friday. It showed something that was rather fascinating: Option traders have been at a more elevated level of fear for a longer period of time than during the 1987 crash. The comparison is one between short and sharp (1987) versus high and protracted (2008). Its between a brief peak and a prolonged elevation. "U.S. stock investors have been more fearful for longer than they were in the weeks before the October 1987 market crash, according to a gauge known as the old VIX. The CHART OF THE DAY shows the closing values for this indicator, the Chicago Board Options Exchange S&P 100 Volatility Index, in the past two months (the white line) and the same period 21 years ago (the red line). This year, the old VIX climbed from the start of September through Oct. 11, when it surpassed 100 in intraday trading for the first time since the month of the crash. Back in 1987, the index stayed below 30 until the Friday before stocks tumbled. The indicator is derived from prices of options on the S&P 100, as its name suggests. The current version, introduced five years ago, uses S&P 500 options and includes more contracts in the calculations. Their readings tend to be similar. The VIX closed yesterday at 62.90." Follow Up: "It's a great time to buy or sell a home!" Well, they were half right. When that NAR ad campaign came out exactly two years ago, it was a pretty damned good time to sell a home. Not so much . . . 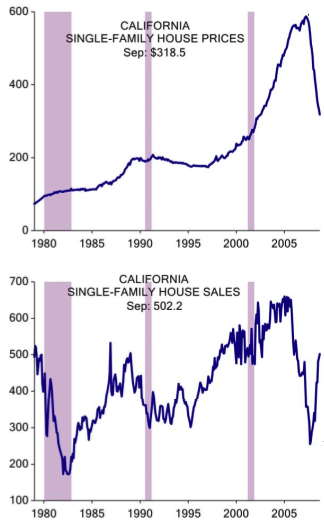 There seems to be this idea going around -- both parties, both candidates, lots of economists -- that the way to "fix" the economy is to stabilize home prices. This is incredibly misguided. Prices are still terribly elevated, and until they revert back to levels that are affordable and clear out the massive excess inventory of new and existing homes, there can be no stabilization. Of all the wrong lessons to take from the mortgage, housing and credit crises, this remains the very worst one. If you remotely believe in a free market -- even one where players are regulated to prevent their own worst instincts from getting the best of the them -- the last thing one should be doing is targeting asset prices. That is what Greenspan did throughout the 1990s and in the early 2000s, and it one of the primary causes of our present woes. Yes, you can regulate behavior; No, you cannot regulate prices. 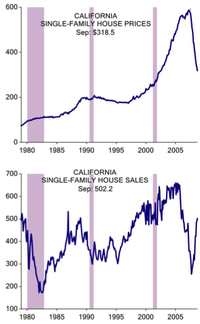 For a classic example of this, have a look at California home sales last month (see chart, top right). Home sales shot up a huge 96.7%. Why? Because home prices fell 40.9% in September alone. Foreclosures and forced sales are driving prices back to levels that are attracting buyers, and are affordable to potential buyers. Its not just sale prices that reveal how overpirced homes still are today. Have a look at this chart, via Ed Leaner. It was part of a paper he presented at the UC Berkeley - UCLA symposium last week. 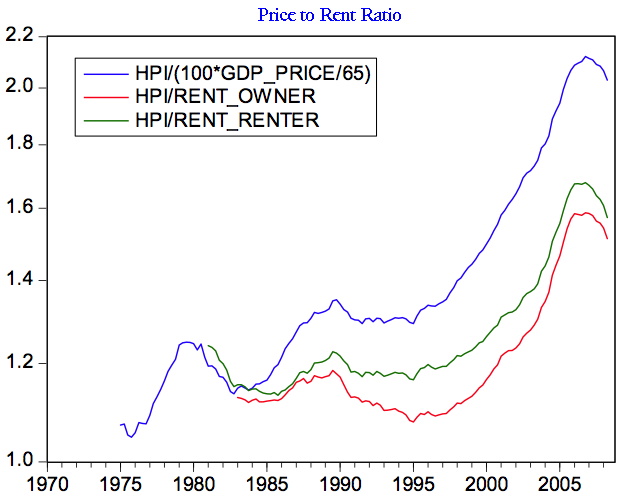 This chart also shows that prices remain significantly elevated versus rentals. Until price reverts back towards historical norms, the excess inventory will not be removed, the foreclosures will not stop, the total sales will remain depressed. The sooner Washington D.C. figures this out, the better off the economy, and the homeowners and buyers in the US will be. Why are the Cycles in Homes and Consumer Durables So Similar? Herein lies the simple problem in trying to “save” so many mortgages: A huge swath of them should not be saved. Some of that is due to price, some of it is due to not wanting to reward irresponsible behavior, but the bulk of it is simply because the people living in these homes cannot reasonably afford to pay for them, even after a 20-30% workout. There are now more than 10 million “home-owers” underwater, with their mortgages greater than the present value of their homes. Since they have little skin in the game — thanks to banks that did away with down payment requirements — there is little incentive for them to tough it out. Not surprisingly, it is FDIC Chairman Sheila Bair who is leading the push towards a mortgage workout plan. She wants policy makers to take action to help people stay in their homes — thereby taking pressure off of the FDIC, which insures the banks. Why? More foreclosures = more bank failures = bigger FDIC obligations. The problem with this current rescue plan is that it is designed to “prevent the continued downward spiral of the housing market.” But that is EXACTLY what the housing market needs — overpriced homes that are not selling need to come down in price. We had a normal price increase from 1996-2001, and then a near vertical set of price gains from 2002-06. Any framework for systematically modifying loans that fails to comprehend that is doomed to failure. Continue reading "Moral Hazard of the Coming Mortgage Bailout "
Here’s the latest act of idiocy: Blaming the media or the Bears for the credit collapse and market crash. Great. You guys are posting stuff that will create a self fulfilling prophecy. Yes, it was all Floyd Norris of the New York Times who cut rates to 1%, and then kept them there for a long time. And, it was Norris who forced the banks to lever up 40X. It was he who forced the rating agencies to slap a triple AAA on junk paper, it was Norris who mandated that hedge funds, trusts, pension funds and other buy this junk paper.And of course, it was Norris who forced all those mortgage originators to write those NINJA loans, and all those home buyers to take 2/28loans they could not afford when the reset occurred. Why does the internet cause people to turn their brains off? Does anyone ever think for even a second before posting nonsense like this? Self-fulfilling prophecy? Here’s a self-fulfilling prohecy: Write thoughtful intelligent commentary on the economy, and a large swath of humanity will trip over themselves trying to demonstrate why IQ test are given on a cuvre. 1) Because the NBER has not yet declared this a recession only means the official start and end dates are unknown. A recession can occur regardless of their declaration. 3) By that definition, we have likely been in a recession since December 2007, or perhaps January 2008. Its an understatement to say these are difficult times for banks. Between the mortgage collapse, the Treasury recapitalization, and the recession, they are trying to do business -- and that that involves some risk. But doing so without losing too much money involves doing less business. They have become utterly schizophrenic. Whether its the TARP or the credit crisis or deleveraging or something else entirely, I cannot tell you. But damn, these guys have gotten weird. Back in August, we noted that numerous banks and brokers were sending nastygrams to their HELOC clients telling them "Too Late!" Unused portions of equity lines were being withdrawn. Our own Citibank HELOC, which was about half unused, was withdrawn 2 months ago. Yesterday, we received a letter offering us a new HELOC from Citi -- for the same amount that was withdrawn in August. Our Visa via JPM/Chase went through the same process. A short while ago, I had a month of extensive business travel expenses. Before we even got the bill (which was paid off in full) came a sort-of-odd, borderline rude letter about our (high) credit use. It was "Thanks for the business, but please use credit responsibly, ya deadbeat." It was a strange letter. Any review of the charges could see it wasn't frivolous, but were all business T&E. My solution was to switch to an Amex card, and not use the Visa for business expenses. That was September, and last week, we got a JPM letter -- We want your business! We are raising our credit limit on the Visa. I understand the fear that firms have when they are lending these days. As the NYTimes writes this morning (Consumers Feel the Next Crisis: Credit Cards), another credit crisis is on the horizon. But you guys better get a more coordinated message. You are confusing and self contradictory -- and its easy to see how you could alienate some, less understanding clients. "First came the mortgage crisis. Now comes the credit card crisis. Lenders wrote off an estimated $21 billion in bad credit card loans in the first half of 2008 as more borrowers defaulted on their payments. With companies laying off tens of thousands of workers, the industry stands to lose at least another $55 billion over the next year and a half, analysts say. Currently, the total losses amount to 5.5 percent of credit card debt outstanding, and could surpass the 7.9 percent level reached after the technology bubble burst in 2001."